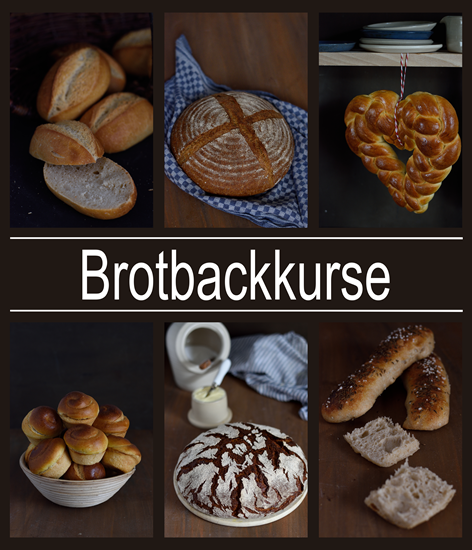 As you could see already last week at Instagram was the last baking course im Raum44 very successful. 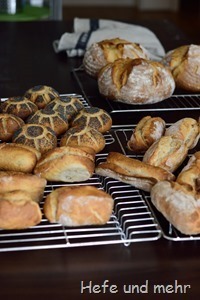 In a small group, we baked in just three hours an aromatic buttermilk loaf and a bunch of different shaped rolls. For the participants which were all beginners in baking it was a good opportunity to take a first step into the world of bread baking. And as you can see in the picture all were very successful in forming rolls and loaves. And beside kneading and forming there still enough time for all the questions and for bit of chatting. 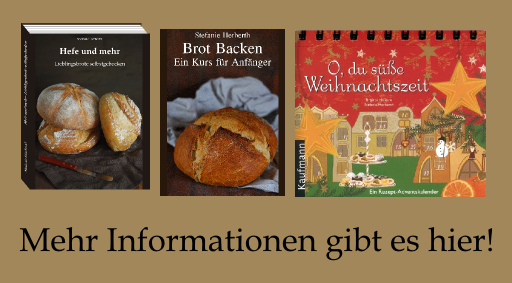 And now I’m thinking about the courses for the upcoming autumn and here I have a question: Would a course about “wheat free” baking with only spelt, emmer, einkorn and kamut interesting for you? I personally like the idea and would start working on recipes during the summer when there is some interest from your side. At the moment my heart belongs once again the wide variety of rolls. Especially the square once which are just cut from a high-hydration dough are favourites. 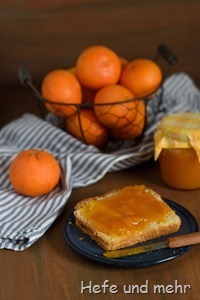 And so it would be sad if this recipe would get lost in the whirlwind of inspirations in the last weeks. I baked this spelt squares already some weeks ago, their were part of our easter brunch as I felt that we would need some whole grainy beside pretzel rolls, cheese rolls, bakers rolls and my beloved Kieler Semmeln. And so I took the same matrix that worked so well for the Luftikus and this whole grain rolls: A long rise and a high hydration. This time I used the combination of poolish, yoghurt and a long rise to give a complex flavour to the rolls, while the physiilum seed hulls helps to make the highly hydrated dough easy to handle. 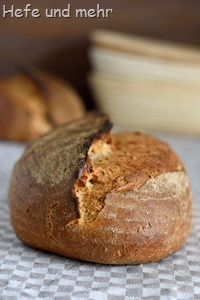 The Oat bran in which the crust is covered adds a crunchy effect to the crust and helps to achieve a fairly crispy crust which is not so easy for psyllium grain rolls. Sometimes the spontaneously created breads are the best. 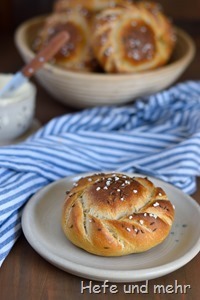 Breads that base on the actual stock in the ktichen cupboards can turn out to be new favourites, just like this potato rolls. And this caraway seed bread follows this route. After refreshing my differnt starters I had some leftovers that needed to be used. And as I planed to visit my uncles birthday party later this day I decided to bake a bread that would make him happy: Caraway Seed bread. Another discovery of my search for regional breads is the Salzweck. 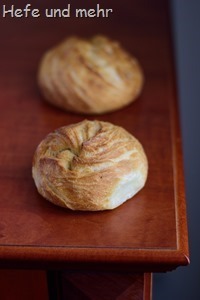 Its a roll which stems from the region Baden and which is formed in a special way. Its rim is folded in a similar way like used for Kärntener Kasnudeln or for the Handsemmeln. Its not so difficult to form and to proof this I took a video from the forming process. 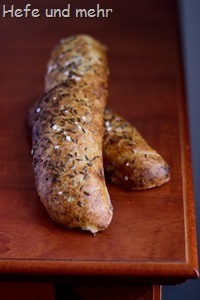 The roll comes golden brown out of the oven and provides a fluffy soft crumb under its crisp crust. This is due to the combination of the macial combination of egg yolk, butter, enzyme active malt and vitamin C from the powdered rose hip. To make the flavour deep and complex, I added a Biga to the dough, too. Taken together this yields a beautiful looking roll with great aroma! Some month ago I bought a apple slicer with two exchangeable cutter one for apples and one for for cubes. I planed to use the cube cutter for making french fries but it works only so-so. The apple cutter is a tiny bit better. But then – while forming rolls- I had THE idea which save the apple slicer from the waste bin. The cutter is perfect suitable for cutting rolls! Why I didn’t had this idea already much earlier I don’t know. The deep cuts open flower like during baking and I’m totally in love with their appearance. 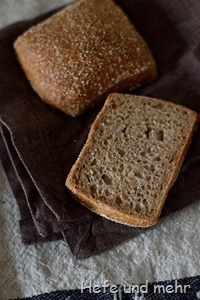 The inner values of the rolls are beautiful as well: 40% whole grain pushes it to the healthy side, but the crumb is nonetheless fluffy and soft, the crust is crunchy and covered with seeds. It is once again a great roll for our breakfast table! This was a great weekend in Berlin! The smell of bread was everywhere and I had the change to try so many different specialities. Not only on the Brotzeit Market, but on the evening before as well when all of the participants came together to chat and eat. A lot of the Bakers brought their favourite bread and I spent that evening of sampling nearly 20 Breads. My personal favourites were: a bread with sprouted spelt, a loaf with sprouted sun flower seeds and a ciabatta like bread with hot pepper and olives. But there was a delicious walnut, a bread flavoured with nettles, and different great rye breads as well. The different breads and the interesting conversations about bread, grain and bees at this evening will be inspiring my baking in the next time for sure! 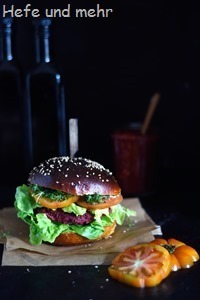 A good burger is always a favourite here – and so the collection for burger buns on the blog is already big. Because Burgers are never a fast food for us, as everything – from fries to buns – has to be homemade. And once in a while we have a new idea what we could try next. 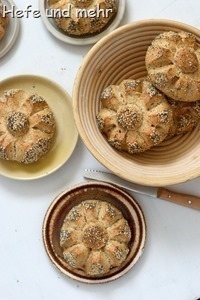 The course for children takes place from 11:30-12:30 and we will bake “Sweet Turtels” from a sweet braid dough. 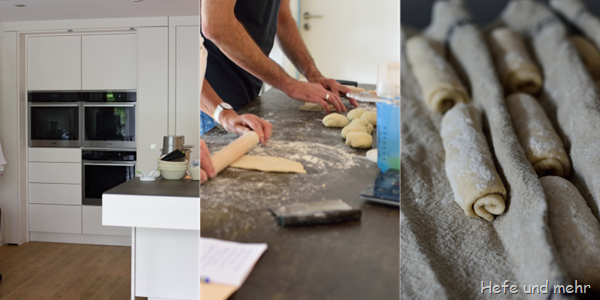 The course for adults has the topic “regional rolls” and takes place from 13:30-14:30 . Half of the slots can be reserved on the market day, the other half can be reserved beforehand by sending a mail to kochschule @ markthalleneun. de .